Welcome to the game where you score points because someone's sneezing food! That's right, in this game you guide a Puppyblew through a field in pursuit of a tasty peanut that his Elephante friend has shot from his trunk. Sound disgusting? You bet! Let's get started! 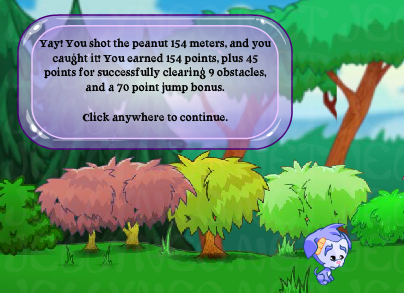 The goal of the game is to shoot the peanut 200 meters and catch it at the end of the run. (Of course, you can always get extra points by shooting it farther...and less points by shooting it less far.) You'll get three tries each game, and your score is additive—the total is the sum of the three tries. To begin each attempt, your Puppyblew will be sitting patiently at the Elephante's feet, waiting for him to shoot the peanut. You are responsible for shooting the peanut as far as Elephante-ly possible. To do this, alternate between the left and right arrow keys as fast as you can, and press the up key when you're ready to shoot. The Elephante's face will start out purple-y and get progressively redder. The redder the face, the farther the peanut will fly, and the faster your Puppyblew will have to run to keep up. Purple won't get you far, while pinkish-red will shoot a decent distance, but even redder than this will get you far past 200m! When you let fly the peanut, you switch to controlling the Puppyblew to chase it down. To do that, you must guide the Puppyblew through a field at about the same speed as the peanut is flying. The right arrow key will speed you up, the left arrow key will slow you down, and the up arrow key will make you jump. Why jump, you ask? Because there are lots of little obstacles coming your way that you have to clear. And you better be watching—the fast you're running, the faster the obstacles will come flying at you. The arrow will tell you where the peanut is—stay right underneath it as best you can. Scoring's pretty simple for this game. You get a point for every meter the peanut flew, but only if you caught it! Then, for every obstacle you successfully cleared, you'll get 5 points. And tacked on to that is whatever sum of points you earned for performing flips over the obstacles—that's how people get the high scores! At the end of the three tries, your scores for each are added together to make your total score. Be super careful of the obstacles—if the peanut is flying really fast and you trip over even a few, you'll lose the peanut entirely. Go for the combination jumps—they'll give you bonus points. If an obstacle is coming too fast, though, just jump normally—you don't want to lose the peanut. If you find yourself far ahead of the peanut, you can deliberately trip over an obstacle to slow yourself down without changing your running speed. This obstacle isn't actually an obstacle—you can run over it! If you start a combination jump, then you press right or left to change speed, the combination is unharmed. This allows you to set up combinations while you're running so that when an obstacle comes, you have to simply jump up. Well, that's your lot! Best of luck with all your peanut-shooting endeavors! Hmmm...that won't get me a trophy...back to the practice fields!